Choose to manage your students' work using our Learning Management System (LMS), or allow students to do the exercises in their own time, as self-study. You will be able to assign exercises to your students, track their progress and see their marks. If you already have an account, go to step 3. Check your email for your log in details:User name and Organisation ID. Click the Launch LMS tab and enter your log in details. When you are logged in click the Online practice tab to set up your classes. For help click the Get Started button and read the 'Guide to digital workbooks and online practice'. Your students will work through the exercises at their own pace. You will not be able to track their progress or see their marks. Tell your students to find the instructions at the back or front of their book. Instructions will be printed on the page or on a card. Your students should follow the instructions for Option 3 (self-study). They will need to go to www.oxfordenglishtesting.com/unlockand enter the unlock code provided. They then need to select 'Online skills practice' from the first menu. 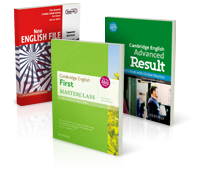 This will automatically take them to oxfordenglishtesting.com where they can register by choosing the Register now button for I am a self-study student. Tell your students to open the card at the back of their book, and follow the instructions for Option 3 (self-study). They will need to go to www.oxfordenglishtesting.com/unlock and enter the unlock code that is printed on the card.